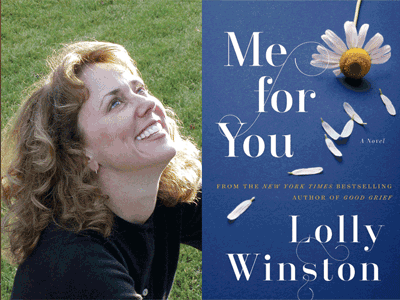 Lolly Winston--New York Times-bestselling author of Good Grief--discusses her poignant new novel, Me for You. The last thing Rudy expected was to wake up one Saturday morning, a widow at fifty-four years old. Now, ten months after the untimely death of his beloved wife, he's still not sure how to move on from the defining tragedy of his life--but his new job is helping. After being downsized from his finance position, Rudy turned to his first love: the piano. Some people might be embarrassed to work as the piano player at Nordstrom, but for Rudy, there's joy in bringing a little music into the world. And it doesn't hurt that Sasha, the Hungarian men's watch clerk who is finally divorcing her no-good husband, finds time to join him at the bench every now and then. Just when Rudy and Sasha's relationship begins to deepen, the police come to the store with an update about Rudy's wife's untimely death--a coworker has confessed to her murder--but Rudy's actions are suspicious enough to warrant a second look at him, too. With Sasha's husband suddenly reappearing, and Rudy's daughter confronting her own marital problems, suddenly life becomes more complicated than Rudy and Sasha could have imagined.